Every two weeks, Seibertron.com brings you a Top 5 list related to all things Transformers written by a Seibertron staff member. These are my opinions (just like movie or game reviews hosted by sites are still just the opinion of one person) so what matters most is what you guys think of the topic or list, and I hope to see your own lists or comments on omissions and ranking. Let's have fun! All previous lists can be found here. 10 years. 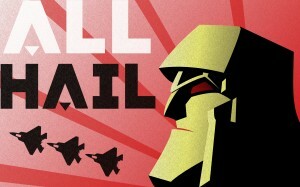 It's been 10 years since IDW's All Hail Megatron started, and it's amazing to think it was that long ago - it seems like only yesterday people were deriding it for taking away from a unique story, having very bad and basic writing; and in general being one of if not the worst thing to come out of the continuity so far. Yes, it wouldn't be a stretch to say a sizeable amount of IDW Transformers fans don't like this story. But we all know the criticisms - we all know why it garners such hatred, whatever your opinion on the story. So as the story reaches such a milestone this year, how about we look at the positives? It is my personal philosophy that no matter how bad a story, no matter how bad the writing or the characters or anything else is; you can find something decent in there. It may be a very worn out needle in an enormous mound of haystacks, but everything has some good points. Which is why today, to coincide with the recently released trade paper back, I'm counting down the top 5 good things to come out of All Hail Megatron! They're funny. 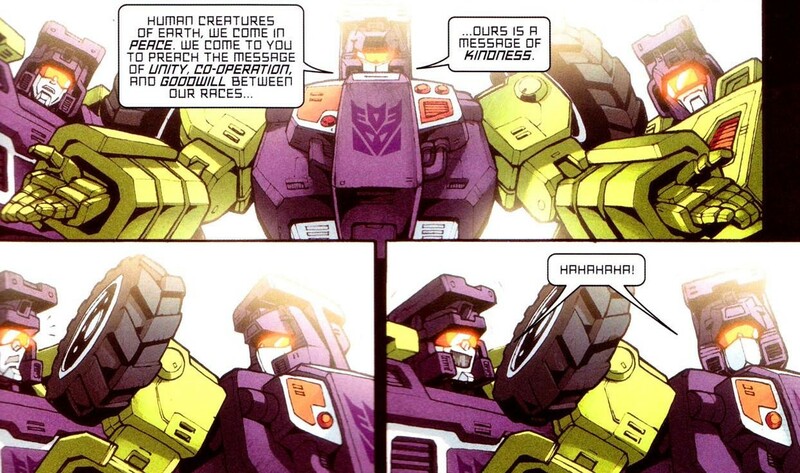 I really have nothing else to say; while I don't usually enjoy the direction of making Decepticons evil for the sake of evil, I just really like these panels and think they're hilarious. ... onto number 4! I did say something about a very worn out needle, right? Yes, this isn't an amazing thing or anything that will really save the story; but when the comic focuses so much on characters from Season 1 or 2 of the cartoon, it's very refreshing to see someone this bizarrely obscure show up. You'd think the comic would have gone with Shockwave or a Cassette or even an oddly intelligent Thrust for the role of Mad Decepticon Scientist, but instead we get someone dredged up from the Generation 2 toyline who was had never been used in official fiction before; far before writers like Roberts and Barber started using the likes of Tailgate, Skyfall or Roulette. Not too much to comment on, just an awesome little cameo. Let's leave aside the arguments of which one is Rumble and which one is Frenzy - the comic calls the blue one Frenzy, so I'm calling the blue one Frenzy for this article. Though there is a reason the arguments over which one is which is so prominent for them; that being that not a lot else stands out about Soundwave's twin cassettes. They're generally just little grunts that do some chip damage and crack some jokes; and occasionally one of them pulls out some piledrivers - though the second one isn't seen doing much of anything most the time. For a few pages, this comic changed that. When the order is given, the tiny Decepticon lets loose a shrill cry that brings everyone in the area of effect into an insanity-inducing nightmare - including himself. So for a couple images we get these rather frightening images of Frenzy going on a bloodlust-induced rampage against helpless soldiers. Not bad for the little sometimes-blue sometimes-red assistant of Soundwave. I will be the first to admit that I am not the greatest art critique in the world. I'm a story and characters person; when it comes to the actual lineart and colours of a comic the best I can say half the time is "this doesn't look good" or "this is friggin' awesome". But you know what? These covers are friggin' awesome. From Communist-esque propaganda to Megatron standing triumphant with Prime's head on a pike to a homage to the well-revered Batman comic The Killing Joke; All Hail Megatron went out of its way to give you some damn good art before you even opened up an issue and they all managed to convey a single message - Megatron and the Decepticons here, they have won, oh ****. Nothing much else to say aside from asking you to look at the examples below and urging you to search around the net for more of AHM's covers because they're really, really good. Modern IDW readers know Thundercracker as a former Decepticon who has grown used to living on Earth; having possibly the closest relationship with humans of any of the Transformers and wanting to stay out of the war as much as possible - though sometimes helping out the Autobots when he feels he must - to focus on of all things writing screenplays and looking after his dog. He's a wonderful person, and it's fantastic to see him be such a unique and fun character in the franchise once later writers got a hold of him. So it might surprise some people that this is the story the seed of that characterisation was planted. Before All Hail Megatron, Simon Furman - rather ironically - wrote Thundercracker among other Decepticons much as he was in the Generation 1 cartoon. A personality-less mook who done the grunt work for Starscream and Megatron; no character traits to speak of, nothing really worth remarking on. All Hail Megatron surprisingly changed this. At a few points in the story we see him very dissatisfied with how Megatron is handling things; how extreme his methods are - the creation of the Insecticons, and the dishonour in slaughtering humanity. And at the very end of the comic, when Megatron's forces retreat and prepare to drop a nuclear bomb on America; Thundercracker throws his faction off and catches the nuke, flies it into space and detonates it - before Skywarp shoots him down for his betrayal. It would take some time for him to develop into the dog-loving dorky scriptwriter we know now, but it was wonderful to for once see this character get any sort of characterisation and for it to go in such a heroic direction without him completely becoming an Autobot. This easily makes him the best part - and the best character - of All Hail Megatron. 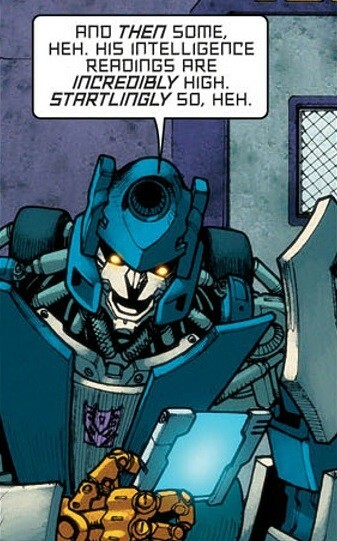 I was trying to get into IDW (for second or third time) by reading that story originally and it almost put me off from ever trying again (I think I've had two more attempts since, one being Sins of the Wreckers and other being MTMTE but again I just can't seem to care for IDW's version at all). Anyways the mention of it coming out in TPB I should mention it's also the next volume of the UK's hardback book collection. Or at least first 6 issues are in the next volume with rest to follow. Good wholesome post. I approve. 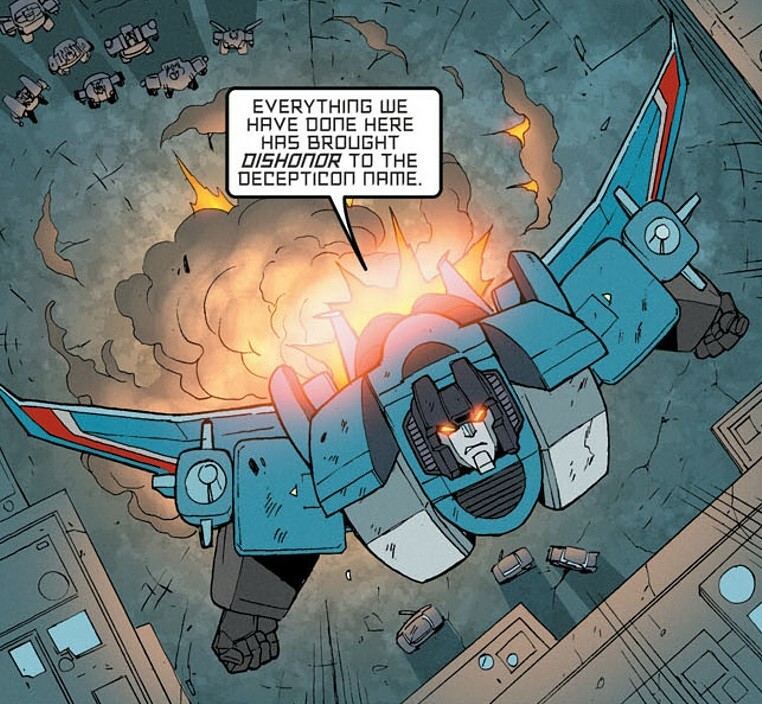 Thundercracker's change/characterization was my immediate thought and hope for number one. Agree. in a series where most of it is looked on unkindly, Thundrecracker was the diamond. AHM was my introduction to IDW. For me it was the closest thing to G1 that I had witnessed in over 20 years. Factoring in around 08' that Bay's crap was destined to only get worse and that Animated cartoon looking and being stupid for the most part around that time. So AHM was a breath of fresh air for me personally. It motivated me to go back and read Furman's run as well which was enough to keep me interested during Costa's subpar run. Sooooooo, I don't really care who hated AHM or why. I stay out of discussions about IDW's comics, mainly because I've only read the first 3ish years of books so far. So I was shocked to hear that everyone hated AHM. I actually find the IDW comics in general to be extremely convoluted and unnecessarily complicated. I thought AHM was a breath of fresh air, although perhaps too simple to fit in with what IDW was doing. AHM reminded me of the good old days with the G1 cartoon. 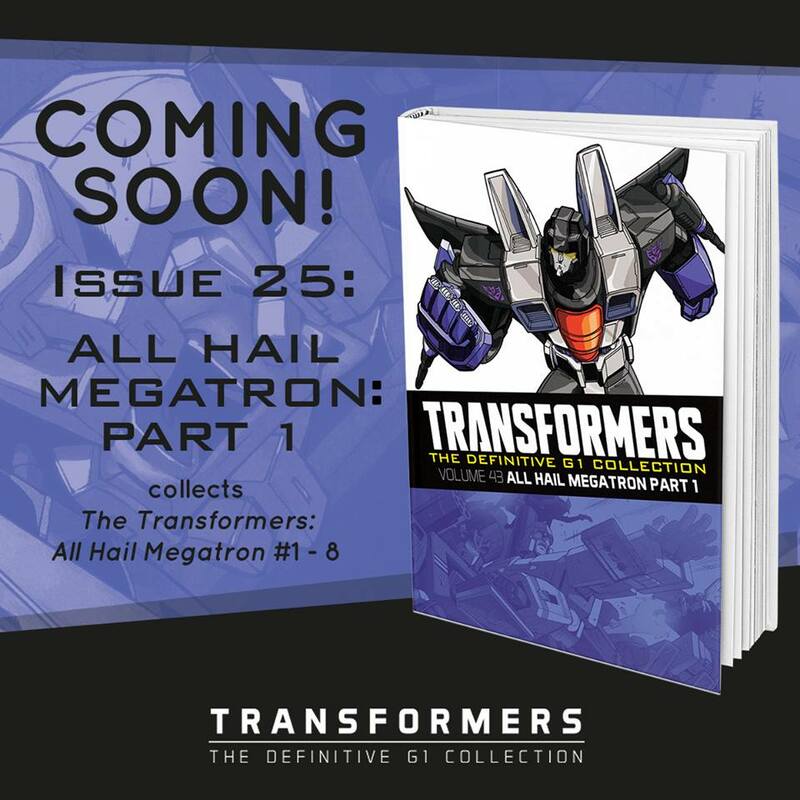 Honestly, the only IDW stories I truly like, are: All Hail Megatron, Megatron Origin, and a handful of Spotlight's. Ramjet's was pretty funny. YoungPrime wrote: So AHM was a breath of fresh air for me personally. Hey, keen minds think alike. Where's the first real look at Megatron's philosophy? His discussions with Starscream throughout? I would rank them first before Thundercracker. It's there we see there's more to Megatron than just take over the universe with a bunch of thugs. We see him admit that to build the society, he will have to kill the Decepticons, because his army has become far too entrenched in violence to function as a proper society. It's there we see Megatron admit his army has grown out of control and farbeyond what he originally envisioned because of all the constant wars. It's there we see Starscream come to the realisation the reason Megatron is always so tough with him, but never outright kills him, is because Megatron is training him, preparing him to take command of the Decepticons and that to hold a position of such authority, you have to take it yourself and not get it by chance, and only then will you be strong enough to hold the reigns of the monster and steer it properly. And we see that pay off in the end when Megatron goes down and Starscream grabs Megatron and instead of claiming total leadership like usual, does the proper second in command thing and take battlefield command, calling a retreat and making sure Megatron comes with him, having reaffirmed his loyalty to Megatron until such a time he is prepared to take it by guile and force. Even the sodding comics after this forgets this awesome character development between these two. And it's never been brought up again, either in comics or discussions. WHY AM I THE ONLY ONE WHO EVER REMEMBERS ALL THIS GREAT CHARACTER STUFF????? Insurgent wrote: Where's the first real look at Megatron's philosophy? His discussions with Starscream throughout? I would rank them first before Thundercracker. It's there we see there's more to Megatron than just take over the universe with a bunch of thugs. We see him admit that to build the society, he will have to kill the Decepticons, because his army has become far too entrenched in violence to function as a proper society. It's there we see Megatron admit his army has grown out of control and farbeyond what he originally envisioned because of all the constant wars. It's there we see Starscream come to the realisation the reason Megatron is always so tough with him, but never outright kills him, is because Megatron is training him, preparing him to take command of the Decepticons and that to hold a position of such authority, you have to take it yourself and not get it by chance, and only then will you be strong enough to hold the reigns of the monster and steer it properly. And we see that pay off in the end when Megatron goes down and Starscream grabs Megatron and instead of claiming total leadership like usual, does the proper second in command thing and take battlefield command, calling a retreat and making sure Megatron comes with him, having reaffirmed his loyalty to Megatron until such a time he is prepared to take it by guile and force. Even the sodding comics after this forgets this awesome character development between these two. And it's never been brought up again, either in comics or discussions. Isn't all of that picked up, a redeveloped, in Spotlight: Megatron? Which, admittedly, comes after the detrimental Costa run, which undoes everything you've talked about in this post. This 12 issue series (I don't count furmans coda blah...) is my favorite of the entirety of IDW to date. It's the only one that looks & feels as if it could be taken from the original Transformers animated series. Nothing before or since has really impressed me. Combiner Wars and Titans Returns were ok, but were way too short because IDW was too busy planning its own multiverse mess. What's the best version of the AHM books a fan should get if he's never read the series before? There are several different TPBs of the AHM books, and I don't know which one to get. I would like the complete story, with all the extras. Rodimus Prime wrote: What's the best version of the AHM books a fan should get if he's never read the series before? There are several different TPBs of the AHM books, and I don't know which one to get. I would like the complete story, with all the extras. Either the hardcover Complete AHM, or the TPB of Complete AHM, which was either recently or will soon be released. It has it in the title: all the stuff. everyone felt compelled to choose a favorite seeker.